ARCHOS, award-winning technology innovator, and leader in the portable media player market, now introduces a new concept: the Internet Media Tablet. The new line of small portable devices: ARCHOS 5, ARCHOS 5g and ARCHOS 7 deliver a new way for customers to enjoy continuous and instant access to the Internet, Media and TV. ARCHOS redefines high-end portable devices with an ultra-thin design, combined with a new interface and an ergonomic design for surfing the Web and getting instant access to media content. Customers can access their favourite video and music content by creating shortcuts directly on the homepage. The new ultra-thin Internet Media Tablets provide the power of a laptop with the world’s first implementation of the ARM® Cortex™ superscalar microprocessor and a high resolution 5” or 7’’ touch screen (800x480), which lets you enjoy media content in high quality. The new processing power means users of ARCHOS’ Internet Media Tablets now have an unrivalled way to surf the Web on the go, with web pages fully displayed on the ARCHOS screen as with a PC. One of the best features of the new line of products is the fully-fledged email application, which lets you check and reply to emails and share attachments with anyone (only compatible formats). The 3.5G connection from ARCHOS offers a permanent connection to stay in touch and enjoy media content while on the go. You can enjoy new animated wallpapers, high resolution playback with the HDMI output on TV, a capacity up to 320 GB and a search engine facility to easily find files. The ARCHOS Internet Media Tablets offer a new internet experience: the customer will enjoy quick full page Web surfing, an email application, Web videos, Web TV and even Web radio streaming. The ARCHOS Internet Media Tablets provide an unrivalled way to surf the Web on the go. No need to zoom in and out as on a PDA or a Smartphone, web pages are displayed full size on the ARCHOS screen. The ARM® Cortex™ superscalar microprocessor combined with the high resolution screen gives the ARCHOS 5 and 7 the power of a laptop for the ultimate web surfing experience. Plus, with Adobe Flash™ 9 video support, you can natively browse video-sharing websites such as Dailymotion™ and Youtube™. The 3.5G technology for the ARCHOS 5g lets you enjoy a permanent connection to the Web and access to emails via a 3.5G/HSDPA network connection. When connected, via the Mini Dock, to a 3.5G – HSDPA USB dongle, the ARCHOS 5 and 7 can be connected to a 3.5G network, thanks to a plug-in available in the 4th quarter. The email application allows you to check emails on the go directly on the Internet Media Tablet. The IMAP or POP email service allows you to send, reply to and transfer emails easily. All attachments can be stored on the ARCHOS device’s hard drive and be shared (compatible formats). The virtual keyboard makes writing emails a quick and easy task. ARCHOS’ tablets let you access nearly 1,000 Web TV channels, over 10,000 Web radio stations and 100,000 podcasts in less than 3 clicks. Radio and TV start streaming instantly from a worldwide list of traditional and independent stations. It’s easy to watch daily news and sport at any time, whether you are at home or on the go. The ARCHOS Media Club provides easy access to large media content library directly on your device. The Media Club remains the easiest way to get video and music content on the go, with an even richer library of movies, documentaries, music albums and games from new partners and the biggest industry players. Media is available to buy or rent in a couple of taps and start watching instantly on the ARCHOS Internet Media Tablet. The high resolution 5” or 7” screen delivers the finest image available on a portable device, with the same viewing comfort as a 32” or 42” TV screen in a living room. Videos in DVD or HD quality on the go never looked so good. The high resolution screen perfectly reproduces each picture in such detail that individual pixel can’t even be seen. You can browse through photos with a simple flick of the finger or play a slideshow of your last vacation, with transition and music effects. Fans of music can bring their entire CD collection with them on their ARCHOS device, and even create playlists without using a PC, and with the album artwork covers your music will come to life. You can enjoy a large choice of games on your ARCHOS, such as poker, Sudoku or a round of golf. Premium games can be purchased directly from the tablet or at www.archos.com, and other Flash™ based games are downloadable for free on the Web. At home, it is easy to watch a movie or listen to music stored on a PC, directly on an ARCHOS device without transferring the file. Just browse the PC hard drive wirelessly and play any file stored on it by streaming it via a WiFi network. No transfer needed, just stream. The ARCHOS 5 and 7 allow you to transfer files quickly and easily via the USB 2.0 connection to a PC (can be used as a portable hard drive). The optional Mini Dock also lets you transfer photos directly from a digital camera, USB key or USB hard drive to the ARCHOS to enjoy photos on the go. Your entire personal library can be stored on the ARCHOS 5 or 7 thanks to its high capacity hard drive of up to 320 GB: all media content resides in the palm of the hand. With the optional DVR Station, the ARCHOS tablets offer a fast and easy way to record TV programs for viewing back directly on the tablet or TV. The TV program guide lets you easily schedule and record movies and TV programs. TV shows can be located on the program guide grid and recordings scheduled, allowing you to enjoy your favourite programs when and where you want. 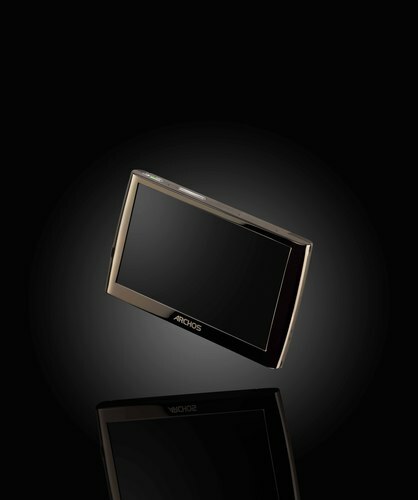 Once connected to the DVR Station, the ARCHOS 5 or 7 can turn a TV into a real multimedia platform connected to the Web to enjoy all the ARCHOS’ functions on the big screen. Movies can be enjoyed in HD quality, as well as music, high resolution pictures, games or the Worldwide Web. Your Home TV wherever you are ! With the TVportation plug-in, you will be able to broadcast live TV to a portable device, such as a Smartphone, laptop or ARCHOS’ Internet Media Tablet, anywhere in the world via a WiFi connection. The new feature allows you to watch your favourite TV programs at home, or on the go. Many functions can be added to your ARCHOS 5 and 7 thanks to the large choice of accessories. Recording TV, watching videos on a TV and charging an ARCHOS device are the main features of the DVR Station. You can easily schedule and record TV programs from a satellite receiver, cable box or digital TV adapter with the Electronic Program Guide. The remote control with its keyboard and built-in mouse allow you to surf the Web or stream videos on TV from the comfort of your sofa. Perfect for when your on the go, the Mini Dock charges your ARCHOS tablet quickly (approx. 3h), and let you transfer files directly from a USB key or a digital camera, watch videos on a TV via the Video Output (S-Video in high quality or Composite in standard quality). The optional 3.5G Ready plug-in lets the customer have permanent access to the Internet via a 3.5G USB connection. The GPS in-car holder turns the ARCHOS 5 into a fully fledged GPS. Available at the end of 2008, the TV Snap-on turns the ARCHOS 5 or 7 into a digital TV to receive free digital TV channels and record programs in DVD high quality. - Podcast Video Plug-in to playback video podcasts with H.264 and MPEG4 formats, and to listen to audio podcasts with AAC sound. A large choice of other accessories is also available, such as the Battery Dock to get more battery life, the Helmet Cam to record sports events or week ends with the family, and the DVR Snap-on for recordings on the go. The ARCHOS 5 and 7 tablets will be available from selected retailers and the ARCHOS online store www.archos.com from August. The ARCHOS 5 has a recommended retail price of £279 for the 60GB version and £360 for 320GB. The ARCHOS 7 is available with a recommended retail price starting at £360 for the 160GB and £440 for the 320GB. All products are supplied with headphones, an ARCHOS USB 2.0 cable (for file transfer and product charging), an adapter for the DVR Station and mains charger (only for the ARCHOS 7). ARCHOS released the first pocket-sized HD-based MP3 player with the Jukebox 6000 in 2000 and since that time has revolutionized consumer electronics devices. The company invented the portable media player in 2003 and was the first to bring television recording, wireless and touch screens to Portable Media Players. Now, ARCHOS introduces the Media Internet Tablet, offering users instant uncompromising access to the Internet, Media Content and TV. Established in 1988, ARCHOS has offices in the United States, Europe and Asia. ARCHOS is listed on Euronext Paris, Compartment B, ISIN Code FR0000182479. www.archos.com. This press release was distributed by ResponseSource Press Release Wire on behalf of Focus PR in the following categories: Men's Interest, Entertainment & Arts, Consumer Technology, for more information visit https://pressreleasewire.responsesource.com/about.